Jamie has read 4 of 10 books. Jamie read 38 books of her goal of 35! Jamie read 163 books of her goal of 150! Jamie read 114 books of her goal of 100! Jamie read 109 books of her goal of 100! Jamie read 64 books of her goal of 60! 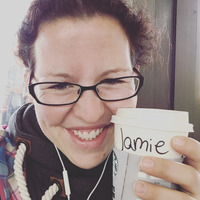 Jamie is an author, wife, mother, reader and coffee lover who loves to take you on an emotional ride with her books. When she was younger, it was her best friend who got her into writing in the first place. School was boring? Afternoon off? Fanfic writing was what they would do for hours to no end. Publishing, though, hadn't been anything on Jamie's radar until she woke up one day from a very vivid dream. It was one of those you can't get rid of, so she ended up writing it down. And writing some more on it. Until a full story started to emerge. It was her best friend who ended up pushing her to take the next step and put the book out there. Ever since then, Jamie has been writing all kinds of different stories, all centuring around women or Jamie is an author, wife, mother, reader and coffee lover who loves to take you on an emotional ride with her books. Ever since then, Jamie has been writing all kinds of different stories, all centuring around women or girls fighting against their inner (or sometimes outer) demons. The stories range from Young Adult fantasy, to women's fiction or contemporary romance. Whatever idea comes to Jamie's mind. To ask Jamie Summer questions, please sign up. I also read it in one sitting. I'm not gonna spoil this book for anyone, because you have to read it to believe it. Jamie is 31% done with Verity: I feel scared already. And as if my mind won't be able to take it. Another Staci book I truly loved. A great story with characters you can't help but fall in love with. We’d love your help. Let us know what’s wrong with this preview of Water Weaver by Morgan Sheppard. hi there!! i made it finally!